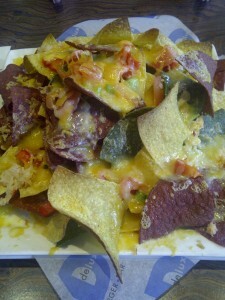 Lobster nachos at Delux Burger bar. There are actually chunks of visible lobster hidden amongst the blend of three cheeses and other tasty toppings. The chips are seasoned and delicious by itself, but of course when loaded with cheese, onions, peppers, tomatoes and lobster, create an unstoppable combination. Dips include a tangy lemon-dill sour cream and tomato salsa, although I personally like them as is. If you’re out for quantity versus quality, these nachos are not for you… in that case I would recommend Original Joe’s (the small order is large enough to be an entree!). Not that OJ’s nachos are of poor quality, but if you’re in the mood for something unique with an upscale twist, these lobster nacho’s will do the trick!